Although the American economy is slipping into a recession, New York City always seems to be in deficit of the coveted ‘nice Jewish boy.’ This creature usually either thrives in the depths of Wall Street or occupies the starch white walls of an Emergency Room; disheartening the typical ‘nice Jewish girl’ from finding them. It is with that in mind that HurryDate, a virtual and in person dating service, dedicates speed dating events to Jewish singles ranging from 21 to 26 of age. Spark Networks, the dating site mogul who brought you such Jewish dating services as Jdate.com and Jewishmingle.com, created HurryDate to provide an efficient, free and slightly awkward way to meet new people. Having parties around the UK, US and Canada, the creators Ken and Adele invite people of all ages, ethnicities and religions to come out and have fun at a variety of hand picked trendy bars and lounges. 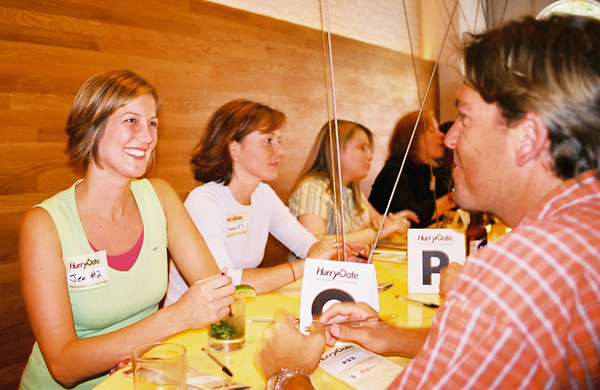 Speed dating parties cost $27.75 for HurryDate members and $37.00 for non-members. But to register for a virtual profile on HurryDate is free. A party was arranged for young Jewish singles on July 23rd taking place in the lower east side of New York City at the Egyptian-themed, Kush lounge. Promptly beginning at 7:30pm, the amiable host assigned numbers and gave score cards to the 40 fairly bashful men and women. He explained that each person had about four minutes to spend with each date, after which, daters kept track of their suitors by circling ‘yes’ or ‘no’ on the card. Letting go of their initial embarrassment of resorting to speed dating, Jews of all varieties got their drink on; from corporate suits to hipster snobs decked out in American Apparel, there was truly an eclectic mix. As the dating began, the same generic questions arose; name, occupation etc. The conversation either took off fabulously or remained stoic, and that’s where the awkwardness set in. Commonly appropriate ways to dodge interaction with a less than perfect match are to smile and laugh while continuously glancing away, or take long gulps of that third cosmopolitan you absolutely need. They should get the picture by then. But despite all the giggling and eye traveling, for better or for worse, a few characters made their way into memory. The laid back computer programmer tried to make girls feel special by requesting to sit next to them, but didn’t realize that although we are at a speed dating event, it isn’t always best to spread yourself around. Or at least not so obviously! Then there was this pompous Berkeley graduate who basically called my field of study “kind of bulls**t”. And, although his name was Israeli, he didn’t forget to mention that the country had only been around for 250 fifty years, so how could he ‘be’ from Israel? Again, smile and laugh. Grit your teeth, but smile and laugh. Not always a bad thing, names of prestigious schools consistently kept creeping up in conversation. Ivy Leaguers like Columbia, Harvard and Yale littered the humble little lounge near Chinatown. It boggles the mind to think that these educated people rely on such arrangements to meet mates. Thinking that the jackpot lay within the realm of speed dating, it only makes sense that busy lawyers have no real time to ‘waste’ and in this way optimize their time while not wasting yours. After the speed dating itself was over, the majority made their way to the bar in order to mingle beyond the four magical minutes they spent together. The host then instructed the daters to return to hurrydate.com and enter their scores. If the opposite party circled yes, and you didn’t reciprocate, the website will ask if you want to change your decision. After getting the scores back, it’s up to either party to establish the connection with the person’s online profile. The most exciting part is finding the person you had a great connection with felt the same way. So if the beefcake from Yale is up on your list of matches, the waiting game might need to be played. If nothing comes out of resulting messaging, at least you got to experience a new area of town, or take away some possibility of hope of finding love in the big apple.